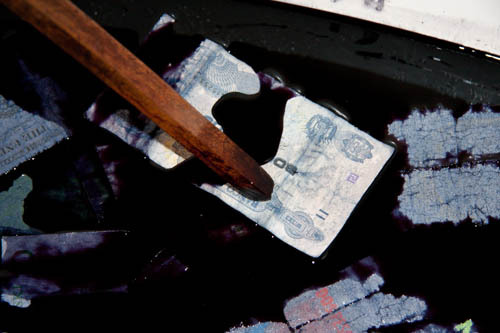 I will be doing a money-laundering performance on Saturday, Sept. 6th at Museum Baerengasse in Zurich. I will start at 7pm and be doing it all evening. I will be turning your money into black money (Schwarzgeld) for you to freely use. You will also have the opportunity to apply for black money accounts with several Zurich-based banks. Please come by and bring your own money to launder/bank. The exhibition focuses on the sense/nonsense, functioning/failure of power structures and systems such as the financial system, the performance-oriented society and the art market mechanism. The idea originated from the encounter with the surroundings and the history of the Museum Bärengasse, which is located in the middle of Zurich’s financial district and galleries’ quarter. Only recently the plans to convert the building into a money museum were abandoned. The artists deal with themes such as the market crash in 2008 (Julia Bornefeld), the endemic disease of burnout (Carlo Speranza), the money laundering and black money scandals at financial institutes (Robin Gommel) and the art market’s narrow bottleneck that allows only a handful artists to achieve commercial success (Elena Habicher). Despite the artworks attempt to address the surrounding, the questions focus on how the context influences their meaning. Within the frame of an art museum the headless man wearing a suit by Bornefeld and the money laundry by Gommel might recall the horrendous prices paid for art at auctions as well as the sharp correction of the overheated art market in 2008. The installation by Speranza might remind of how top mangers ended up in burnouts, however, showcased in the context of a museum, this might also make one think of the people working in the cultural field on a self-exploitive level. The visitor himself or herself is eventually given the last contextual dimension, from his and her knowledge and associations, thus the question must be answered individually of what the meaning is actually created by. This entry was posted in Exhibition, private, Robin sagt das ist Kunst and tagged Art, Ausstellung, CARLO SPERANZA, ELENA HABICHER, Exhibition, JULIA BORNEFELD, Museumsnacht, Performance, Robin Gommel, Schwarzgeld, Zurich. Bookmark the permalink.